Offering direct access to Fort Cochin Beach, Old Light House Bristow is a historic property surrounded by greenery and the Arabian Sea. It features an outdoor pool, a spa, and 3 dining options. 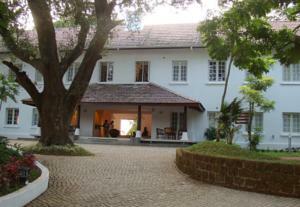 Old Light House Bristow is 290 metres from Fort Cochin and 500 metres from St. Francis Church. Ernakulam Junction (South) is 12.3 km away, while Kochi Cochin International Airport is 8.3 km away. Decorated in different colour themes, the air-conditioned rooms have cable TV and a safety deposit box. Each room has a private bathroom with toiletries, a hairdryer, and shower facilities. Guests can relax in the pool’s hot tub, or enjoy an Ayurvedic massage. The hotel features a 24-hour front desk and 24-hour room service. Airport transfers can be arranged. Featuring Kerala specialities, Vinocean restaurant has large windows with sunset and ocean views. Bristow’s Bistro offers seaside fine dining, while the Lighthouse Lounge serves snacks and drinks by the pool. Free! All children under 5 years stay free of charge when using existing beds. One older child or adult is charged INR 1500 per night and person in an extra bed. Maximum capacity of extra beds in a room is 1. There is no capacity for cots in the room. Any type of extra bed or child's cot/crib is upon request and needs to be confirmed by the hotel. Supplements will not be calculated automatically in the total costs and have to be paid separately in the hotel.